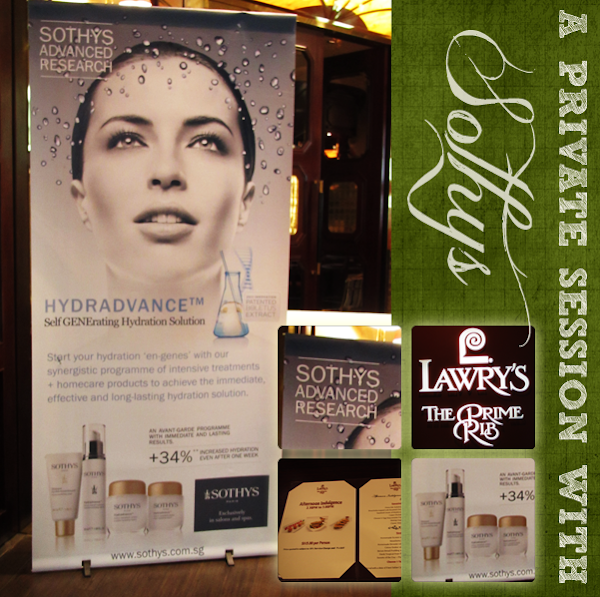 Back in December, I attended A Private Session with Sothys. 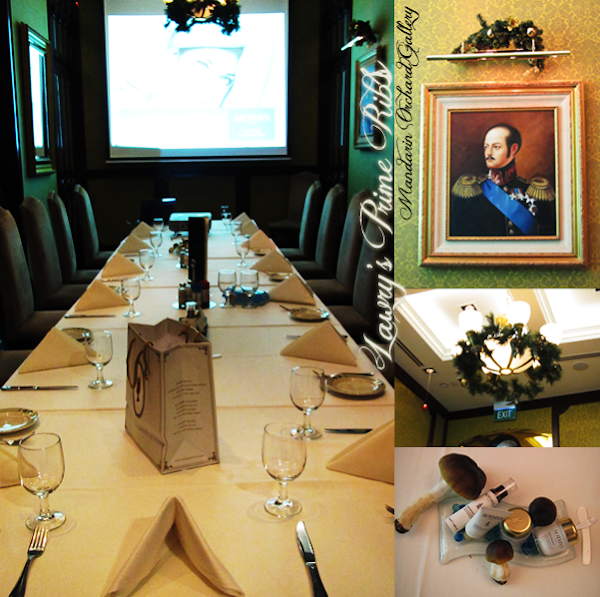 Held at Lawry's Prime Ribs, the session was about their Hydradvance Cosmeceutic Programme. 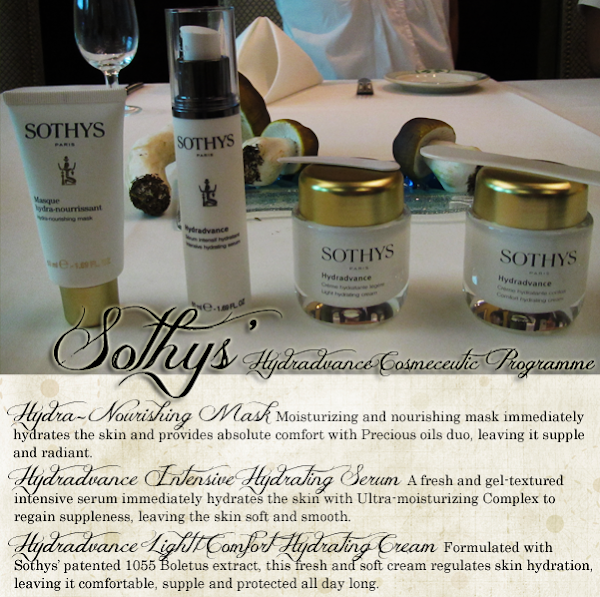 Sothys was founded in Paris in 1946 and it is named after the brightest star in the sky, by the Egyptians. Sothys represented eternal beauty. The brand has been around for 66 years (24 years in Singapore.) and is known to be at the forefront of cosmetological research. Using the latest technology, Sothys constantly comes up with new products and improve existing ones, in order to meet the needs of women. The brand distinguishes itself by its 'ability to maintain its identity while offering new solutions in the constantly evolving beauty world'. The Hydradvance Cosmeceutic Programme targets dry skin (As mentioned in my previous entry, oily skin may mean dry skin. Your skin produces more oil to compensate the drought that your skin is suffering from. Do get your skin analyzed properly.). Dehydration of the skin affects all ages and can be aggravated by the environment, medication (Antibiotics!) and stress. This leads to dull and rough skin, a perfect bed for wrinkles to sprout! Sothys is deeply involved in the research of cosmetogenomics, which is the application of the science of genes to cosmetic science. With their research, they have come up with the Hydradvance Cosmeceutic Programme. This programme uses their patented H2CR Cosmeceutic Complex to boost the healthy cells and 1055 Boletus Extract to stimulate genes so as to restore the skin's ability to re-hydrate itself. The Boletus Edulis, known as 'cep' in French, is an edible mushroom which makes up the core of this programme. It is rich in Vitamin B3, known for its ability to retard the effects of ageing, and Vitamin E, which is a powerful antioxidant. The extract from this nondescript but very potent fungus works on 2 main functions to restore the skin's ability to re-hydrate itself. It first optimizes hydric flows (Which is the transfer of water from the inner layer of the skin to the outer layer.) and so, regulates hydration. It does so be providing a reservoir in the inner layer for the skin, regulating the transfer of the water from the inner layer to the outer layer and then, retaining the water there. Then, it reconstitutes the barrier function of the skin, by strengthening the skin's protective layer and restoring cell communication to further strengthen the layer. Hydradvance Comfort Hydrating Cream, 50ml ($159). The Hydradvance Intensive Hydrating Serum is to be applied after cleansing. Try patting it in for better absorption! The Hydradvance Light Hydrating Cream is light and meant for people with oily skin. The Hydradvance Comfort Hydrating Cream is heavier and meant for people with dry skin.